Home/Posts/Games/CYBER MONDAY GAMES BUNDLE! 18 Games, $19 TODAY Only! 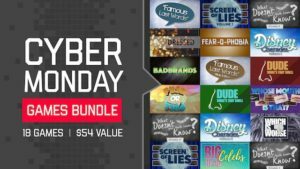 CYBER MONDAY GAMES BUNDLE! 18 Games, $19 TODAY Only! Cyber Monday is here! No that’s not the day when the robots take over the universe–it is the day when DYM has a HUGE sale! We have a massive sale on a games pack you are going to love. Get 18 games for $19 and build up your arsenal of ready-to-go games for that Wednesday afternoon when you totally forgot to prep a game (you know it has happened). There is a huge variety of games to play anytime in the year. “Famous Last Words” will challenge students to figure out what movie the last sentence is from. In the Bible edition, you can wow your leadership team with your students knowledge of Scripture. In the multiple editions of “What Doesn’t your Youth Leader Know?” You turn the tables and see if You know the Bible trivia. Students will guess weather or not you need a raise for all your Bible expertise. There are more trivia style games to keep your students guessing. Check out the funny images of “Big Head Celebs” or “Whose Mouth is That?” And show your students how hip you are to their culture (pro tip: saying hip totally negates your hipness). There’s also the previously unreleased game “Best Dressed” to use during the upcoming awards season. Do you like the games where everyone plays? “Disney Charades” will have your students acting out scenes from their favorite movies. “Dude What’s that Smell” may take some prep to get supplies but having students smell items while blindfolded just screams Youth Ministry! You can also turn the hit Tonight Show game Box of Lies into a participation game called “Screen of Lies”. See who your dishonest students are! No pack would be complete with some this or that style games! “Which is Worse” will give you two terrible options to choose from. Start the arguments now! “Push or Pull” takes a spin at recreating a Price is Right style game for students. See if they know how expensive stuff is on Amazon. With all these games you will be set. And did we mention the steal of a deal on Cyber Monday? There was some serious back room negotiations to get the price down so low, but the big reason it is so low is so that YOU WIN! Get this steal TODAY before the bundle price goes up! Don’t miss out!